Mixed use, education, retail and contemporary art gallery, owned by a UWinnipeg /Plug-In Institute of Contemporary Art. 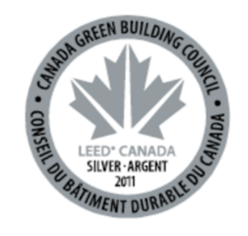 • Foam-insulated metal panels and curtain wall help the building achieve energy performance targets. • Integrity of the existing structure has been protected while everything new looks like it was meant to be there. • Interconnected sky-lit student lounges and four-story interior atrium space provide natural light. • 12 SMART classrooms/lecture rooms, equipped with the latest technology in computer and audiovisual equipment. • CISCO Tele presence provides expanded opportunities for distance learning, academic meetings and other community initiatives. • Welcoming building design invites the community in, increasing pedestrian traffic for the public access spaces. • Unique blend of business and professional education with arts community. • Supports Plug In ICA’s continued evolution as a research institution. • Plug-In ICA centres on the presentation of art that confronts ideas and issues affecting contemporary society. • Featured Aboriginal art throughout the building supports ethno-cultural concerns and interests.